The housing to the south of the bridge was known as ‘Fox Heads’ or ‘Foxheads’ as it was built for the workers of the Newport Rolling Mills operated by Messrs Fox, Head and Company. The bridge is shown as existing on the 1894 town plan although the housing in the immediate area is still incomplete. 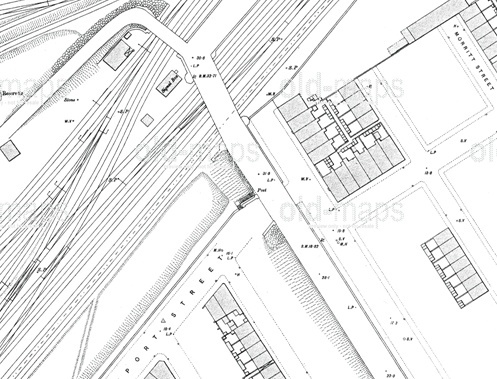 The plan shows that there was actually a sizable ramp which ran from Frederick Street parallel to Marsh Street so another bridge actually crossed the end of Newport Street before crossing the railway. These two pages of memories by a resident say that the last 25 yards of Marsh St was used by the firm PA Mudd for storage, which would tie in with this series of arches that can still be seem today. The north end of the bridge was actually a junction, with a right turn putting you onto Forty Foot Road and towards the Newport Rolling Mills, the retaining wall of this junction is still visible. A left turn was a smaller road which on the 1894 map leads into the Newport Iron Works. A contact at Network Rail informs me they have the structure listed as ‘Marsh Street; and the current metal deck dates from 1912. Sharp-eyed reader Sean has also spotted that the childhood memories on the Communigate website also mention a “Stinky Pole” which could well be a stench pipe that’s possibly still there next to the bridge. 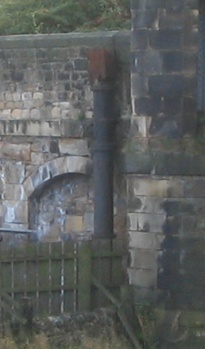 This entry was posted in Industry, Middlesbrough, Stench Pipes by chris.twigg. Bookmark the permalink. Thanks for posting this! I pass the bridge all the time and always wondered about its history and why it seemed to be truncated. I wondered if it had carried a railway once, but now I know the true story behind it! Always been Forty Foot Bridge to me. I used to use it when I was given the temporary job of doing some training for OH crane drivers at the Britannia CW Shed and I used to walk there from the bus stop. I’ve always known it as Forty Foot Bridge. a question came up at work the other day among a bunch of us Smoggies–why forty foot Bridge/Road?? To a lot of railway enthusiasts its known as metz bridge, i`ve always been told thats what its called. The traveler site adjacent is called metz bridge site. I think you will find that Metz Bridge is, in fact to the east of the bridge featured by Chris. Today, it is the road leading off of the A66 North Road Interchange and which accesses the Riverside Park area via Riverside Park Road. However that may have not been the exact position of the original Metz Bridge as the whole area has been comprehensively reshaped by decades of highway engineering. 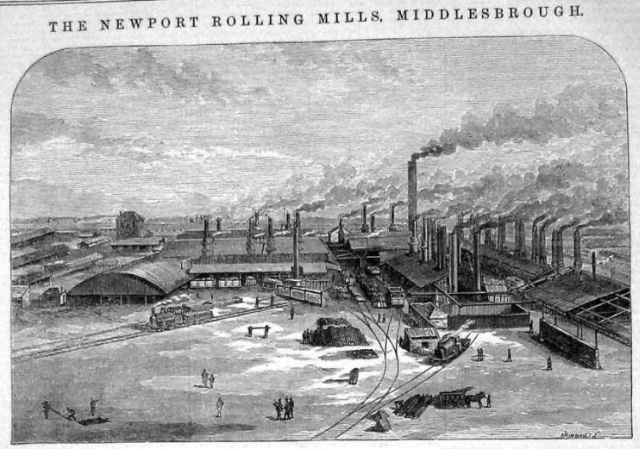 So did Auguste Metz or one of the later dynasty of the family have some input into Middlesbrough’s iron and steel industry ? I’m afraid I drew a blank there, but I am sure there are people out there who know far more. One for the local history societies perhaps. A further note following the last posting. I found some material on Luxembourg steel making which states that the firm founded by the Metz family (and which is now part of Alceler Mittal) was the first to have had licenses on the European mainland for the Gilchrist Thomas process in Bessemer converters as the local ore there (and in Belgium in general) was highly phosphoric, As Bolckow Vaughan were the world leaders in this technology, the links of Metz and Middlesbrough seem clearer. I cycle across this bridge everyday to and from work, and get to ride the helta skelter ramp that must have been attached in the 1960’s sometime to continue the cycle route. I was born at 23 Prince Charles street in 1944 and I remember this bridge very well. I have still got the scar on my head were a brick was thrown from under the bridge, and I used to work at Dicky hills wire works, and I know the bridge as Forty foot bridge. Keep hunting. Tom G.
My mother was brought up in Prince Charles St no 32 Louisa Metcalfe until 1937, when she married. Sadly she is not now with us. good to hear from you, hope life is good. Called big sister our sage “Pauline” and she informed on mam’s marriage certificate address is 32. Fancy a pint let me know? Some Fox Heads names coming up. I remember Gerard Metcalfe Swanie and Little red hen Billy Boy Mathews Kenny and Jimbo Witherley. I lived in Newport Street. My mam & dad lived in unthank st opposite the gas tanks off cannon st.
My mam & dad Kenny and Mavis goodman lived in number 49 unthank St .Or neighbours were joe ? The dart player .And a lady called tess on the other side .Do you remember Mrs macs shop on the corner of unthank & cannon St .My dad was related to the halls who lived on cannon St next door to St Patrick’s church …. Hi , my name is Ian and I was born in 35 Arthur st may 1945, I was delightted to see your posting . I live in western Canada now and if you wish to contact me to talk about old times I would love it. I am married with three children and feel a bit homesick. hope u reply Ian. There was a Ted Collins lived in Stanley Street with his daughter Audrey Timney nee Collins. He used to live on the corner of Lower Croft Street/NewportStreet in the corner house. He’s been dead for years now as has his daughters. The family left there when it was compulsory purchased . Amazing. I was born round the corner from Tommy but I remember it as Fox Heads bridge. Anyone got a photo of the Fox Heads above the front Doors or even the Door knocker on the front door. My older brother Stan worked at either Dickie Hills or Brittania, but we always called it the “wire works”. Ironically Stan only had one hand from a birth defect and came through that job unscathed when most other two handed people working there had fingers missing from work accidents. I think he worked there in the 60/70s and maybe afterwards. I remember this as the Forty Foot Rd Bridge. I was born in Fredrick St (Foxheads) I went to St Pstricks school opposite this bridge. It’s nice to see the photos of the area. Our kids don’t know they are born . Jimmy there were five streets in Fox heads Queen Mary Street prince Giles Street half the street Frederick Street running through the middle new Park Street at the bottom and Saint Patricks school was in March Street which was the senior school the junior school was in the Lawson Street G a.m. I went on to be in charge of demolishing britannia, clay lane, cargo fleet sheds and ovens, the cinter plant and my greatest feat dropping the two big cranes on cargo fleet wharf with a fine colleague. I have just found d this site and it’s great I lived on Marsh street across from the the coal yard, and a short walk from Metz Bridge is I think the name was.